UPDATE! John Clute, Joe Haldeman, and Michael Swanwick have autographed the remaining inventory of IN MEMORY OF WONDER’S CHILD. All copies on hand are now signed by Mike Resnick, Walter Jon Williams, Betty Williamson, Connie Willis, Patrice Caldwell, Stephen Haffner, and frequent Williamson Lectureship guest, Melinda Snodgrass. 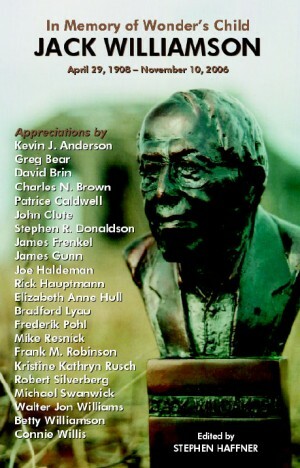 A 112-page perfect-bound chapbook, IN MEMORY OF WONDER’S CHILD honors the career of Grand Master Jack Williamson with memorial appreciations from friends, family and some of the most prominent members of the science fiction field. Also included are Williamson’s 1939 pulp story “Nonstop to Mars,” his last work “The Mists of Time” from 2006, a facsimile reproduction of his 1928 editorial “Scientifiction, Searchlight of Science,” and pages from his 1950s newspaper comic strip, Beyond Mars. Only 500 copies are being produced. We have a small quantity of copies autographed by several contributors (noted in bold) and we will fill orders with these signed copies as supply permits. ". . . a wonderful tribute volume to the departed Jack Williamson. In Memory of Wonder's Child: Jack Williamson reprints three obituaries of the long-lived Grandmaster; a slew of appreciations by his peers; two of his stories, including his last-published one, "The Mists of Time"; some comics work (including a gorgeous full-color page from the strip Beyond Mars on the back cover); and a photomontage. This is a classy yet lively memorial to an SF Pioneer, and, best of all, all sales feed into a scholarship fund in the name of Jack and Blanche Williamson."